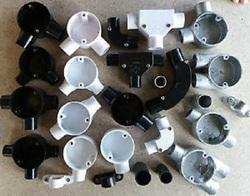 - Conduit Fittings & Junction Boxes Junction Boxes. - PVC Conduits 16 mm NB to 50 mm NB. - Galvanized Steel Flexible Conduits PVC Coating. - Items Offered : Circular Boxes, Bends, Bar Saddles, Looping Boxes, Couplers, Lids, Adaptors etc. Price Range : 30 - 200 Per Meter. We are dealing in only Electrical Conduit.